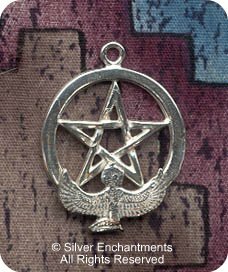 Overall Size: 32mm x 25mm = ~1-1/4" x 1"
> You can Customize this item into a Isis Pentacle -- Choose from : Pendant Only, or on a Sterling Silver Necklace Chain (see last picture for current chain style). When selecting on a SS Chain, your Solid Sterling Silver Isis Pentagram Necklace will come Boxed. 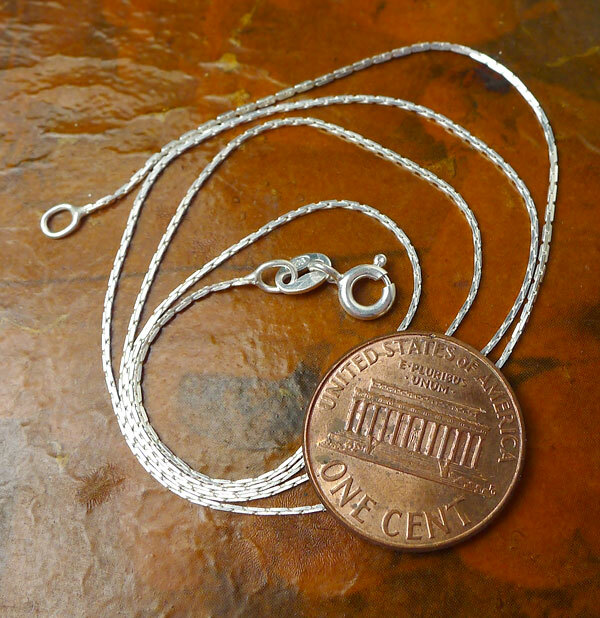 > This pendant can also be converted into a Custom made Sterling Silver Dangling Isis Pentacle Earring. If you need a pair of them, order 2. 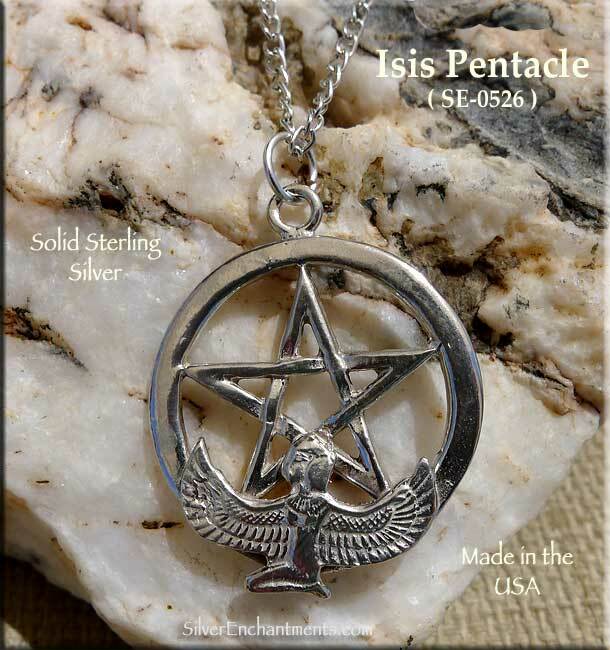 > This item can also be made into a Isis Pentacle Belly Ring | Navel Ring. 316L Stainless Steel - Banana Length : 3/8", 14-gauge. Gemmed ball : 8mm (color will vary) | Top Screw-on-off Ball : 5mm. Custom made Pierced Body Jewelry. 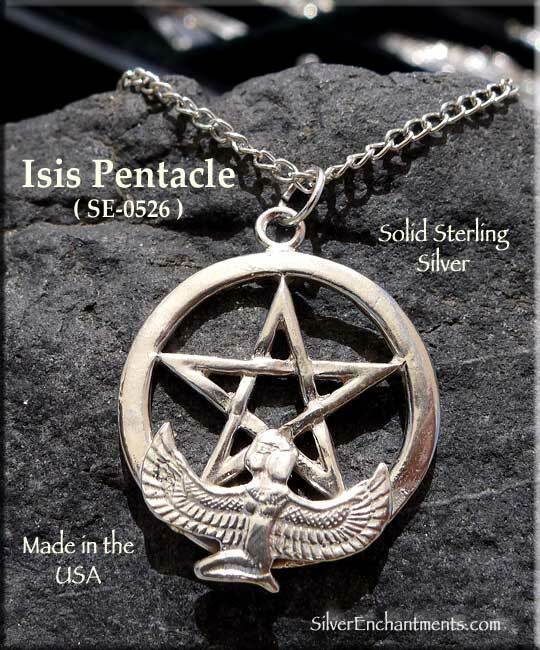 Because we are the manufacturer, if you need more Isis Pentacle Pendants than we currently have available, please feel free to contact us to arrange for a custom-casting session. Isis Symbolism - Isis, the Queen of the Heaven and the Night, is the Egyptian Goddess of magick and mystery, female power and the Moon. Her name means 'Throne' or 'Seat'. In mythology she is the sister-wife of Osiris and the mother of Horus. When Osiris was dismembered by his brother Set, Isis searched for him and brought him back to life. She was worshipped throughout the world under a variety of other names, including: Demeter, Hera and Selene. Isis is the patron of marriage, the moon, divination, motherhood, agriculture, protection, reincarnation, initiation, fertility, magick, purification and domestic life. The cow, the buckle of Isis and the sistrum were sacred symbols to Isis. Isis is commonly portrayed with protective winged arms and, sometimes, the moon perched upon her head. Isis is a sacred part of the holy trinity along with Osiris (the father) and Horus (the divine son).